First there came buildings, then caretakers followed, these evolved into a far more sophisticated being called the facilities manager. However, in between all this is often a person who works for a company and is the ‘go to’ person whenever something needs to be done in the building. Often it is not even their main job, they just happened to pick up the phone when they realised no one else was order a plumber when the toilet was blocked. They would often then become ‘the’ person who sorted out these problems and arranged other services for the building. This person should visit the FM Expo ate Gallagher Convention Centre on the 10th and 11th of May to gain expert help in possibly fulfilling this role more effectively. Gaining new insights, methods, suppliers and knowledge.However. Back to the modern day facilities manager. They have available all sorts of weapons to keep buildings running well, efficiently and in ways that benefit the business owner, landlords and the employees who work there. Technology has taken on a big role in this function. Computers have taken on much of the control of buildings to save money and optimise efficiency. Did you know that you can have a computer detect a water leak in a toilet in a large facility? It will then turn off the water to the toilet. However, if a person opens the door to that toilet it can detect this and turn the lights on and put the water back on just long enough so the person can flush and then wash their hands. How clever is that. Computers optimise heating and ventilation, car parking, lighting and so much more. However, hi-tech does not end there. Many modern facilities have been constructed in concrete. 20 years on the pipes that were buried in that concrete often start to leak. Traditional methods involve closing the facility, stripping the floor and digging up the concrete. Expensive, noisy and very disruptive. One company at the FM Expo solves this problem by relining the pipes in-situ causing minimum disturbance, no jack hammers and efficiently solving the problem. In the words of that famous British actor, Michael Caine, “Not a lot of people know that” The facilities management industry is still in it’s infancy here in Africa, elsewhere in the world it has mushroomed into a multi-billion dollar industry and unlike many sectors, it’s focus is all about improvement and efficiency, plus the emphasis on sustainability and helping the environment.The FM Expo also has a series of seminars hosted at the show,the speakers range from Dr Anthony Turton, a leading expert on the SA water situation to experts such as Elan Kabb and Hassan Shaikh who are experts in office layout and ergonomics. If recycling is a concern, Samantha Choles of the Paper Manufacturers Association of South Africa will give you some top tips to help do it properly. Here in South Africa we are beginning to realise the importance of the industry and there are now specialist companies that can take on the role on behalf of a company. They offer efficiencies of scale, knowledge and expertise that can seriously reduce overall costs of running a building, large or small. If blue chip companies are moving into this space, it can only underline the importance and significance of this growing sector. Plus, all it does is improve the lot of South African citizens. 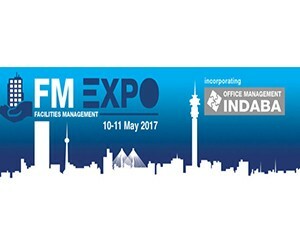 To gain better insights into the Facilities Management industry visit the FM Expo at Gallagher Convention Centre on the 10th and 11th of May 2017. Registration is free and you can fast track your entry by visiting www.fmexpo.org and clicking on the register button.